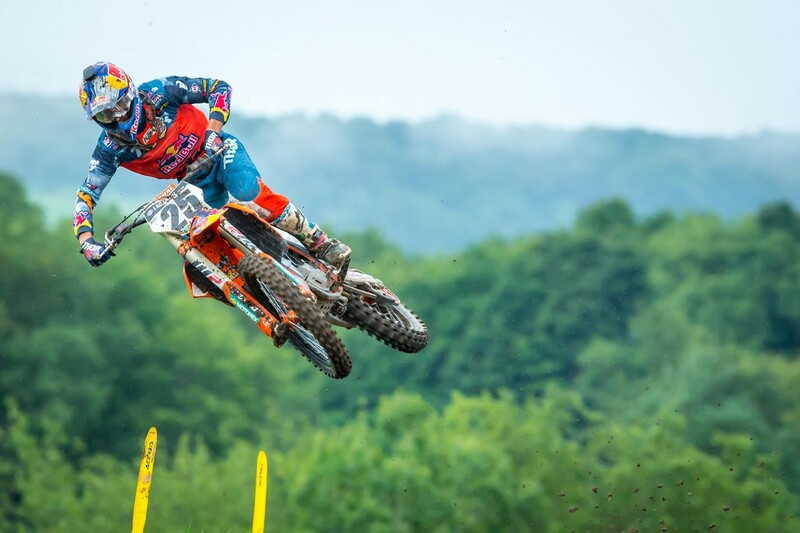 Marvin Musquin (Red Bull KTM Factory Racing) and Eli Tomac (Monster Energy Kawasaki) have split race wins at Unadilla’s 10th round of the Lucas Oil Pro Motocross National, although it was Musquin who was handed the overall after the pair levelled on points. In a breakthrough ride, Rockstar Energy Husqvarna Factory Racing fill-in rider Phil Nicoletti earned an impressive third after lodging a 3-5 scorecard, defeating Justin Barcia (Monster Energy Yamaha) and Blake Baggett (Rocky Mountain ATV/MC KTM). Tomac retains the red-plate as he carries a 15-point advantage over Musquin heading into the final two rounds of the 12-stop series. 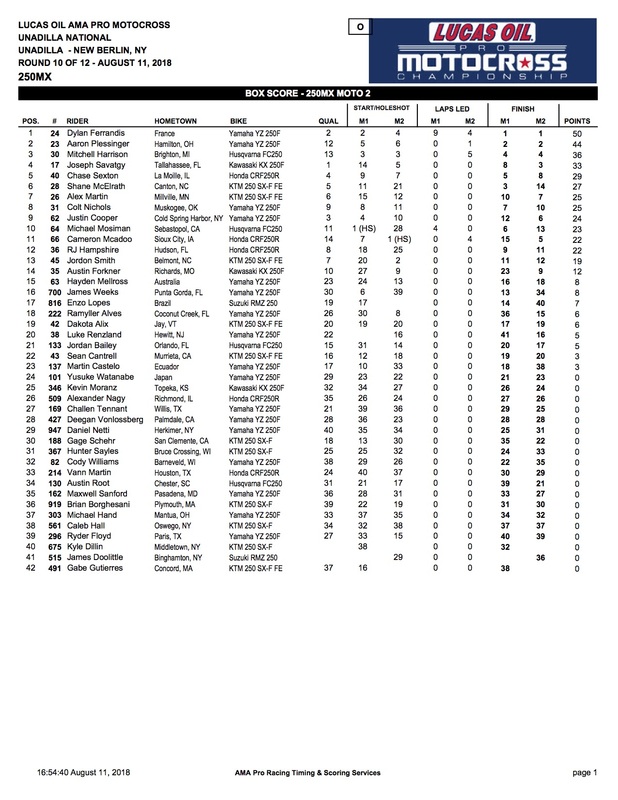 In the 250MX category, Frenchman Dylan Ferrandis (Monster Energy Yamalube Star Racing Yamaha) emerged victorious with a perfect 1-1 results sheet, beating home teammate and red-plate holder Aaron Plessinger (Monster Energy Yamalube Star Racing Yamaha) followed by Mitchell Harrison (TLD Red Bull KTM). 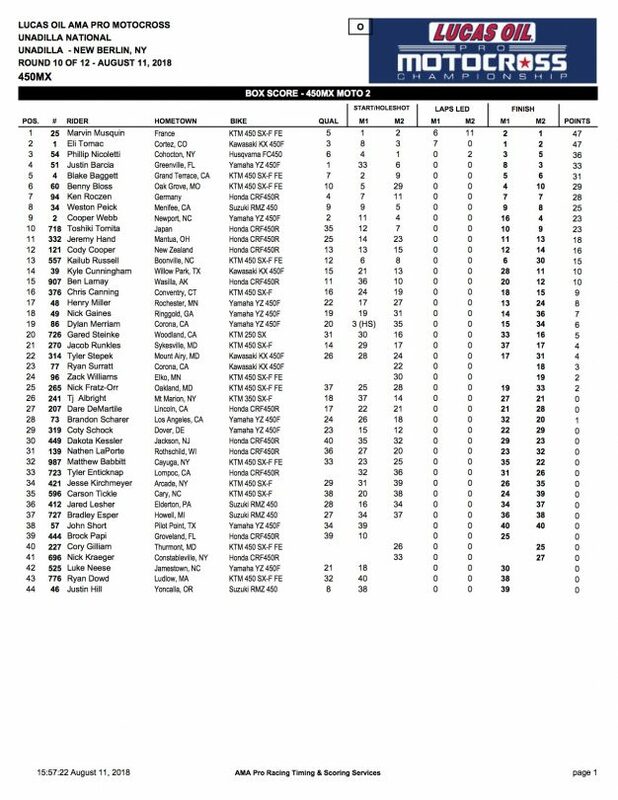 Fourth and fifth were awarded to Joey Savatgy (Pro Circuit Monster Energy Kawasaki) and Chase Sexton (Geico Honda), as Aussie contender Hayden Mellross (CyleTrader Yamaha) was 15th overall. The Pro Motocross championship will now head to Budd Creek on 18 August for the penultimate round of the series.